$18 General admission; $14 Senior/Students; Thursday shows are pay-what-you-will! Tickets may be pre-purchased on- line at http://bit.ly/2N36ifC or purchased at the door. Nunsense features five valiant nuns belting, twirling and tap dancing their way to fundraising enough money to properly bury 52 recently departed sisters. Sister Julia, Child of God, the convent cook, inadvertently poisons the Little Sisters of Hoboken after serving them vichyssoise. Thus, the surviving nuns – ballet-loving Sister Leo, street-wise Sister Robert Anne, befuddled Sister Mary Amnesia, the Mother Superior Sister Regina, and mistress of the novices Sister Mary Hubert – must stage a talent show in the school gymnasium to raise the money! Winner of four Outer Critics Circle Awards, including Best Off-Broadway Musical, Nunsense will restore your faith in the power of comedy. 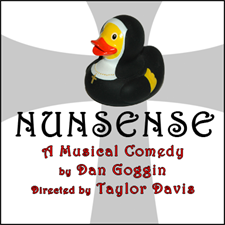 Nunsense, in addition to running 10 years in New York City, has now run in thousands of theatres around the world. Music, Lyrics and Book by Dan Goggin. Dan Goggin is an American writer, composer, and lyricist for musical theatre. Goggin began his career as a singer on Broadway and as a member of the folksinging duo, The Saxons, before writing the music for and appearing in the off-Broadway musical Hark!. This is Taylor Davis’ first time directing for Valley Center Stage. Taylor was seen on stage at VCS in See How They Run, Wind in the Willows and A Christmas Carol. Taylor has performed in, directed, and choreographed various shows in companies throughout the Seattle area such as Seattle Musical Theatre, Centerstage, GreenStage, SecondStory Repertory, Burien Actors Theatre, StageRight, Lakewood Playhouse, Renton Civic, Twelfth Night Productions, Kitsap Forest Theatre, Ghostlight Theatricals, Evergreen Family Theatre, Snoqualmie Falls Theater and more!